The ultimate “colour box”. As a 500-series follow-up to the Portico 5042, the 542 delivers the same thick, musical simulation of tape while drastically enhancing creative control via a number of new features. In addition to the “true tape” circuitry – great for bringing out 3rd-order harmonics – the 542 incorporates a soft-clip circuit that tames the harshest sources and enhances 2nd-order harmonics, a variable and versatile Silk/Texture circuit for three transformer tones in one, and a wet/dry control to blend in the perfect amount of saturation. The 542’s “True Tape” emulation circuit provides the nostalgic rounding and compression usually only achieved by the use of tape, and can offset the harshness often found in digital recordings. Unlike digital emulations, the “True Tape” drive circuit works by feeding a custom-designed transformer acting as a “record head”, which in turn is coupled to a correctly equalized replay amplifier. As the voltage rises on the “record head”, saturation increases, and a soft clip circuit engages at higher levels to round off peak transients. The sound of the tape circuit can be further modified with selectable 15 / 30 IPS modes and a pre/post-tape blend control. 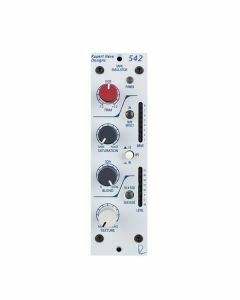 In addition to the tape circuit, the 542 also has the variable Silk & Texture circuitry developed for the Portico II series modules, which allows the engineer to fine-tune the harmonic ratio and tonality on the output transformer. Sends the signal through the “True Tape” circuitry, which is affected by the saturation, blend and 15 / 30 IPS controls. Provides +/– 12dB adjustment of level on incoming signal levels, prior to the tape circuit. Controls the signal level being sent to the "tape head" circuit. As the saturation level increases, the level on the “record” head rises, and the replay gain is reduced so that the overall output signal level remains more or less constant. In a real tape recorder, you would adjust the record and replay gain controls separately - however, in the 542 the record and replay gain controls are coupled so that the overall signal level only varies as the “Tape” saturation level changes. As you approach maximum saturation setting, the output signal level will drop due to the effect of extreme saturation and soft clip. Additionally, to compensate for low frequency loss at low “record head” levels, the saturation knob also controls a low frequency compensation circuit that boosts low frequencies more at low saturation levels, and tapers off at higher levels. This function can be useful on many sources like bass and kick drum to find the balance between a clean, boosted low end (low saturation) and a denser, more saturated low end (high-saturation). Selects the pre-emphasis / de-emphasis, record / replay tape characteristic. The 15IPS mode has a significant “head bump” in the low frequencies centered around 60Hz, as well as a more pronounced roll of in the high frequencies. The 30 IPS mode is generally a flatter response through the high-end with a “head bump” around 120Hz. See the frequency plots on pages 10 & 11. Controls the mix of pre and post tape signals. This allows the engineer to dial in a subtle amount of the tape effect, to better control the amount of saturation, tone and soft clipping in the post blend signal. As the signal gets more saturated, dialing back the blend can be a great way to impart the feel of tape, while maintaining a similar level of detail and transparency. NOTE: The blend control does not affect the Silk and Texture controls, as that circuitry is located at the physical output of the unit. A soft clip engages in the “True Tape” circuitry when the drive meter hits 5 (first yellow LED), and becomes more apparent at higher levels. The soft clip can be used as a way to tame overly transient material like drums, and can be controlled further by using the blend control. Pushing the Silk button engages the Silk Red circuit, and pushing it a second time introduces Silk Blue circuitry. Silk reduces the negative feedback on the output transformer, adding harmonic content as the texture is increased. Silk Blue mode features more saturation in the lows and low mids, whereas Silk Red accentuates the saturation in the high mids and highs. Two eight segment LED bar-graph meters are fitted to the 542 for output level and drive metering. The level meter shows the output level of the 542 before the Silk circuit, and the drive meter reflects the level on the “record head” when the tape effect is engaged. The soft clip circuit is present at Drive levels above 5. Noise: Measured at Main Output, un-weighted, 20Hz-22kHz, Input Terminated 40 Ohms. Frequency Response: Measured at +10dBu, trim at unity.